Anyone that has ever had to sit through a Powerpoint presentation, either at a conference or at work, knows how scary it can be when someone is handed a microphone and a projector. I know I dread attending a presentation by the monotone, slide-reading presenter who seems oblivious to time and space. If only there was a way to get people to cut to the chase instead of feeling the need to drag out a presentation. After all, the longer it takes, the smarter and more informed you must be, right? Not so much. I was at a conference where one group of presentations was done in a PechaKucha format. I have to say, it was the most exciting and most memorable part of the conference. 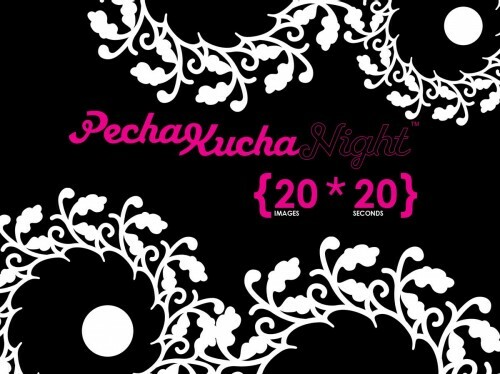 This was the first time I had ever heard of PechaKucha. For those of you who are not familiar with PechaKucha, and I’m guessing there may be a few, it’s a presentation format where the presenter gets 20 slides has only 20 seconds per slide to make their point. The benefit is that presentations are forced to be concise and move along quickly. The name itself comes from the Japanese term for the sound of “chit chat.” Please don’t ask me the correct way to pronounce it because I’m pretty sure I still say it incorrectly. What I really love about the format is that it can be applied in many settings. Sure it works great for conferences or for presenting creative ideas at work. But I’d also love to see this type of format show up in elementary and high schools. With the class size at schools increasing, it’s important that kids get an opportunity to practice public speaking. If a class has 30 students, the presentations can be completed in three and a half hours. There are so many benefits to public speaking such as self-confidence, improved interpersonal skills and most importantly, the ability to communicate. Introducing a format like this at an early stage of the educational process helps students organize their thoughts in a clear, concise manner.